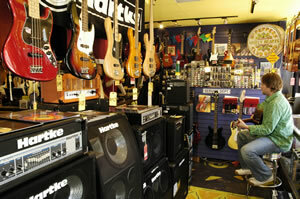 Stroll on into Mark’s Guitar Shop in the Garland Village for some great strumming advice. Where else can you find guys who just love to sell guitars?! Excellent customer service and product knowledge are at the top of their music sheet! Not only do these guys sell instruments they also service the heck out of them. 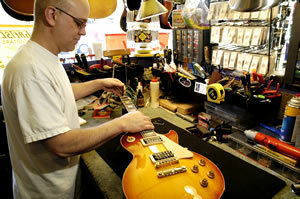 There is a one year in-house warranty on all guitar sales. 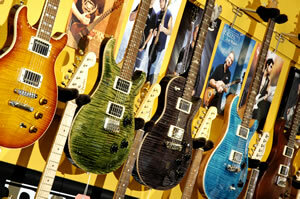 Mark’s features a wide selection of new and used electric guitars, acoustic guitars, basses and amplification. They are dealers for Marshall, G&L, THD, Larriv'ee, Washburn, Hartke, OLP & Spector Basses, Behringer, George L Cables and Connectors, Fulltone, Boss, Budda, Electro Harmonix and Maxon Pedals. 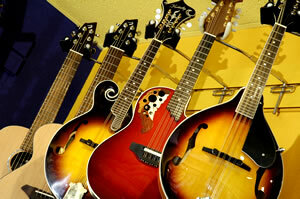 The handy staff will set up instruments for you and also do any necessary repairs. Got a guitar gathering dust? Bring it in as they are always buying guitars….the "Beater the Better"
If you like guitars, this shop is a notable find! With a motto of "Small shop, Small prices" you can’t play a wrong note here!